I love to read because it is the best way to travel. With your imagination you can travel around the world, and you can break the laws of space and time. One reason more for reading in English or French or Spanish or Latin: it’s cheap and, in this country, free, because you can find interesting books in the public library, and you don’t have to pay money in order to take books out. When I read, I go to many countries, times, and I discover different cultures. For me, reading is very amazing and funny. It’s like breath. Now, I’m reading "Other Colors", a book of essays written by Orphan Pamuk, winner of the Nobel Prize for Literature in 2006. 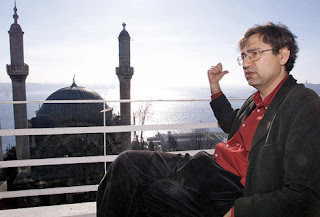 When I discovered Pamuk’s work I was 33 years old. I read his novel "My Name is Red " on a beach called Playa Paradiso, (Paradise Beach), in Guerrero, Mexico. With this novel I traveled to the Sixteenth Century to discover a murder of a painter who drew the Prophet Mohammed, a violation of the religion rules of the Muslims in Turkey. The story is beloved because the daughter of the painter, called Shekure, a beautiful widow with a beautiful name, I think, tries to find the killer like an ancient Sherlock Holmes. In "My Name is Red" Pamuk describes the times when the Muslims didn’t accept images of Mohammed and when they fought to conquer Spain and founded, years later, beautiful cities like Granada, Toledo, and Cordoba. I read "My Name is Red" in Spanish, and the story caught me for its descriptions of strange lives and habits. Yesterday I bought "Other Colors" to discover more about Pamuk’s world. He lives in Istambul, the ancient capital of the Ottoman Empire. I hope I enjoy this book as much as I enjoyed "My Name is Red" which was written when Pamuk was not a Nobel Prize winner yet.